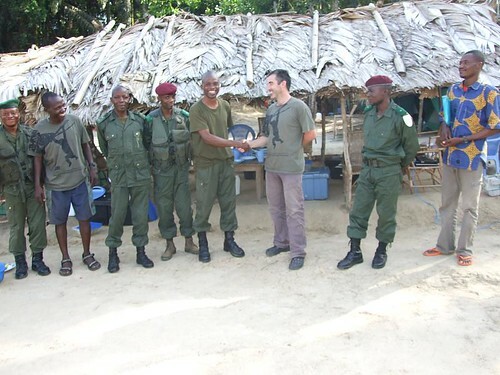 The forests are quieter, the forests are safer and that is thanks to a massive united effort including collaboration from the village of Obenge all the way to the top military, hundreds of km further north in Kisangani. And none too soon. We had gotten One Maimai Down but there was One Central Pin left behind. 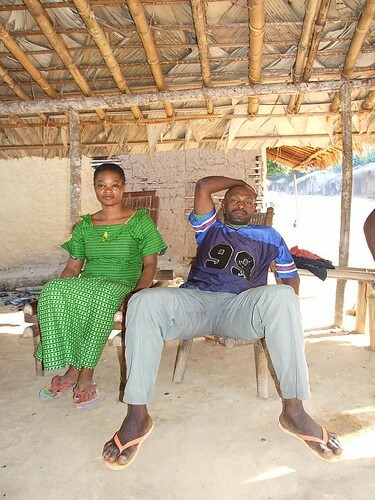 Major Ranger, wearing his hallmark “99” t-shirt, in the central Obenge baraza where he was arrested. Ashley left Obenge in December fearing the worst. And the reports that we received back from Lambert, who was planting and tending the gardens, were not good. From December ’07 through February ’08 Major Ranger and his boys were responsible for the killing of fourteen elephants and two bonobos. At least that is how many we know about; we fear the Obenge forests may well have lost more. True to his word, General Kifwa in Kisangani acted. One of his men, Major John, wearing plain clothes, accompanied Crispin of TL2 to Obenge in order to verify the presence of illegal military arms and terrorism of the population. With the report from his own man, the general sent Major John back with 70 military to clean up the territory of Opala. 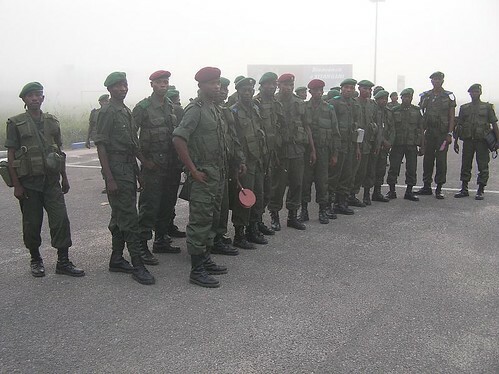 Seventy troops were chosen in Kisangani. Major John in the red beret with hands on hips. Fourteen from this unit, including Major John himself, continued to Obenge to apprehend Ranger. Ashley arrived to find them already present. “ Major John has done really well down here including good control of his troops. 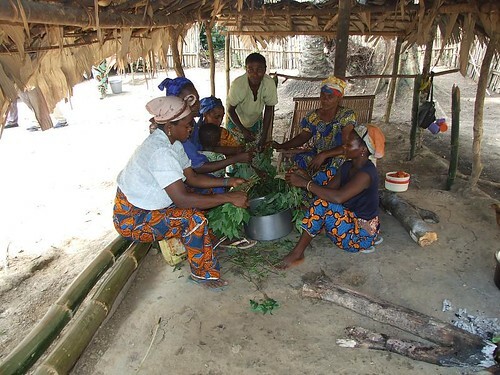 A group of Obenge women assured that the military were well fed. They too benefited from the TL2 gardens. The whole village joined in to help Major John’s unit find the various military weapons hidden in the surrounding forest. A total of 10 Kalachnikovs were removed from the village. 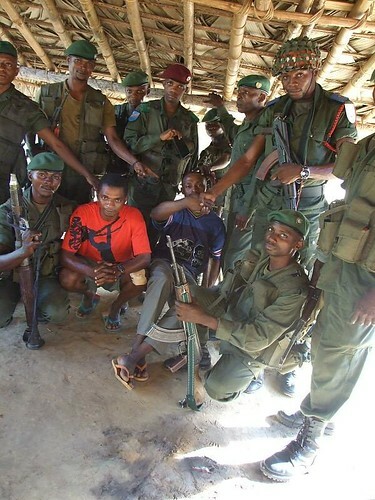 Another 11 military arms, included two FAL along with the usual AK-47s, were taken from the same inter-connected band of poachers in Opala. A last photo opportunity for a few members of the unit and Kahindo (TL2) before Ranger is taken off to Opala and then to Kisangani. 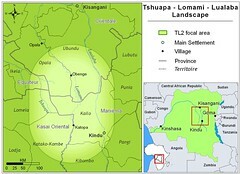 We hope that this is the end for a while of the worst high-end elephant poaching up the Lomami. Ranger. So it is goodbye to him forever. And so is the forest……. This entry was written by Terese Hart, posted on 2008-03-20 at 3:03 pm, filed under Bonobo, Diamonds, gold and guns. Bookmark the permalink. Follow any comments here with the RSS feed for this post. Post a comment or leave a trackback: Trackback URL. Wow! This is thrilling news! Nice work, all, very nice work. Thank you so much for your persistence in removing Major Ranger from the TL2. After what is going in the Virungas, this is truly a positive effort. Thx for all the pics, it’s so rare to get good photo reportage from the field. One less thorn. Many more challenges to come. Yep many more challenges to come — but we are thrilled that Ranger is gone and equally thrilled by the incredible collaboration from so many to get him out. Remarkable really! He stuck to his word — he did what he said he would do Ashley – I am just overwhelmed! Yes Terese, this is what we should all focus on, this collaboration between the government, the local people and you guys, the conservationists! I know it is nearly impossible to send mail to the DRC, but I would love to convey my gratitude and thanks to Major John, and his men for all they have ACHIEVED! And Theresa, many thanks for the monthly contribution. It gives us something that we can count on regularly and that really makes a difference in the bottom line and in morale. I’m digging deep, but here is a liitle something extra on the way, to brighten your day! My day is very much brightened, Theresa. Thank you from me (right now in Kinshasa), thank you from John (right moving upstream in dugout towards Obenge) and thank your from Ashley, right now setting up our new primate study site where they have ALREADY seen an unknown monkey that Ashley had seen in captivity in Opala and had been told came from this part of forest — Thanks for helping to keep them in the field!! Dipesh, What is true is that this country has great mineral wealth that has not brought it peace or prosperity. Look at the NYTimes magazine from before 9/11. I think it was in August. During the period of high coltan prices (2000,2001 I believe) mining camps appeared everyone incuding inside of the Okapi Reserve. It added nothing to local development, local people ended up with debts! most miners were totally impoverished. The wealth was a couple steps up the chain and the coltan was exported to Uganda and Rwanda. Coltan price fell but the same regions produce gold, cassiterite and more. Thanks Terese. I just feel that most people around the world have no real idea (including myself) about the true cost of our comforts and “necessities”. 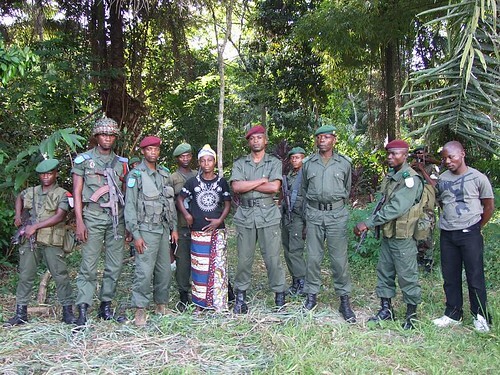 The Virunga Youth Alliance have put an intersting post about this issue.